Two reasons. One: in a real game, some players may modify the executable game so they can cheat. You wouldn’t want to let players with modified games decide on their own position. Using ShipMovement.cs protects your game from unwanted position modifications. 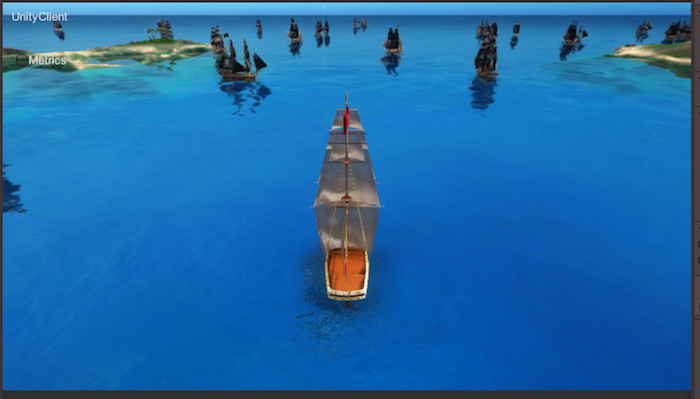 Two: this way lets you re-use ShipMovement.cs to make it easy to steer a PirateShip around. Add a method to the steerRandomly class that sends a random update to the ShipControls. This builds your worker code for local development, and is equivalent to running spatial worker build UnityWorker UnityClient --target=development, as you did in the first lesson. It’s just quicker to run this, as you don’t have to close Unity.